Post-traumatic stress disorder (PTSD) is a mental disorder that can develop after exposure to a traumatic event, it is disproportionally prevalent in Australian first-responders such as firefighters, police officers and the military personnel. PTSD is characterised by severe anxiety, leading to isolation, inability to work and interact with others and the community at large. The social benefits of providing a path back into society for these incredible people are enormous — families are able to function again, individuals are able to work or stimulate the economy through economic and social interaction and, through the power of education and storytelling, they are helping inform the community at large of this very serious condition. We only place PTSD Service Dogs with police and defence force personnel living with post-traumatic stress disorder. These dogs can be trained to provide a combination of physical task-oriented and emotional support to assist their owner and help them to overcome fears. 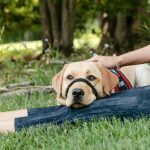 PTSD Service Dogs undergo a unique training placement, where they are trained to work with the very individual and specific needs of their owner, in particular detecting signals of anxiety, or their owner’s ‘trigger”. Upon sensing their owner’s trigger, the dog is trained to perform a specific cue to help alleviate the symptoms of this trigger, for example, engaging in eye contact and body contact to comfort their owner and divert their attention. Standing in front of their owner offering a barrier and space. Entering a room before the owner and turning on the lights so they don’t have to enter a dark space. Entering a room or house and sweeping it for people or intruders, alerting its owner by barking. Providing physical contact if their owner suffers a nightmare. Diverting their owner’s attention to the dog, a technique known as ”anchoring”, helping to bring their owner back to the present moment. Providing continuous companionship and a sense of routine. Have you participated in a therapy program? Do you have a clinical diagnosis of PTSD? Thank you for your interest in applying for a Smart Pups Assistance Dog to help you. The process can be an emotional undertaking and can also be a little unnerving, as you will need to provide personal and sensitive details about the unique circumstances of you and your family. 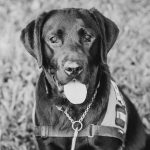 Please be assured we only ask for information we need to properly assess your eligibility for a Smart Pup Assistance Dog and objectively determine how, and if, a Smart Pup could help. We ask for a minimum donation/gift of $20,000. Each certified Smart Pup Assistance Dog costs around $30,000 to raise and train. Smart Pups will work to fundraise $10,000 for you. Smart Pups requires written confirmation from your doctor detailing your diagnosis. We also ask for a professional opinion as to how an assistance dog would assist you on a daily basis and the likely immediate and long-term benefits for you and the family as a whole. Your Smart Pup will be individually trained to master skills to help enhance quality of life and improve the level of independence for you. Your Smart Pup will also be certified for Full Public Access with your agreement to be the ‘Handler’. As the Handler, you must be prepared to dedicate time each day to work with the dog to maintain its health and wellbeing. All dogs must be walked and exercised daily for at least 30 to 40 minutes; your Smart Pup will require the same commitment. One of our trainers will show you what to do and how to work with your Smart Pup when the dog is ready to be placed with your family. We ask for a minimum gift donation of $20,000. Each certified Smart Pup Assistance Dog costs around $30,000 to raise and train. Smart Pups will work to fundraise $10,000 for you. There are a number of organisations that will help individuals but not us as an organisation. Do we understand that a Smart Pup can’t be left outside for long periods as it is trained and requires companionship?